The days of 2D, top-down console Zelda games could very well be over. It’s hard to imagine that Nintendo would go back from a sweeping epic such as Breath of the Wild to the more traditional, quainter games that the 2D Zelda titles tend to be. With the Nintendo 3DS’s lifespan nearing the end of its run, it’s not hard to imagine that without a smaller platform to put a game like that on, we might not see a release in the style of A Link to the Past again. If that makes you a little sad, well… it probably should. I don’t think anyone would argue with the higher value and production that the 3D Zelda titles bring, but what of the magic of the earlier titles? Lost would be their whimsy, their familiarity, their nostalgic value of throwing the player back to a simpler time. Fear not, though. 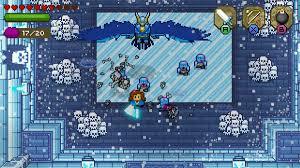 Because while the Zelda series might be moving past this style of game, Blossom Tales embraces it. 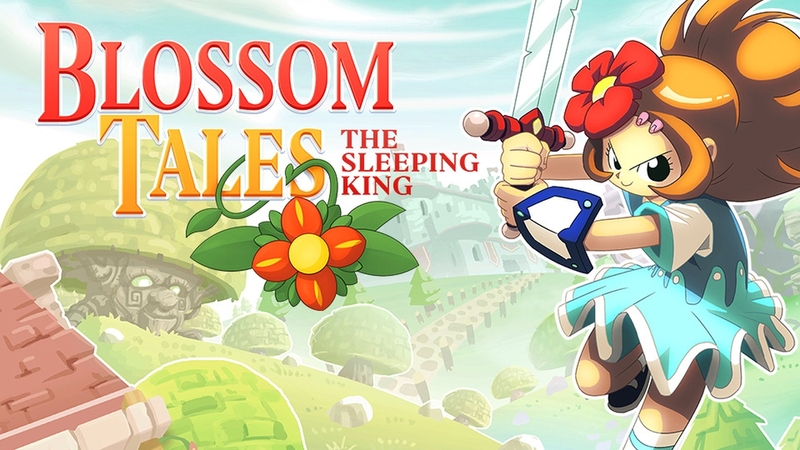 Blossom Tales: The Sleeping King, available on the Nintendo Switch eShop, is a game set in the Kingdom of Blossom. You are Lily, a silent but charming Knight of the Rose, whose quest is to wake up the titular sleeping King and take to task the evil Wizard causing trouble in the neighborhood. This game clearly takes its inspiration from A Link to the Past. You’ll get almost all of Link’s items (sword, shield, bombs, bow, magic spells, etc.) and use them in your quest in a manor similar to A Link Between Worlds‘ magic recharge system. You’ll explore temples, collect treasures, and ultimately, save the day. Some might write this game off as nothing but a “Zelda Clone”, and in many ways, it is (there are some not-so-subtle references to Blossom Tales’ Hylian inspiration). And while this game undoubtedly lifts most of its core gameplay mechanics from A Link to the Past, I’ve played a lot of so-called Zelda Clones in my time and never come away from one with the feeling I had after I finished Lily’s adventure. It’s the little quirks that make Blossom Tales such a joy to experience and help it avoid feeling like a Zelda-Lite. Take the way the game’s story takes place, for example. 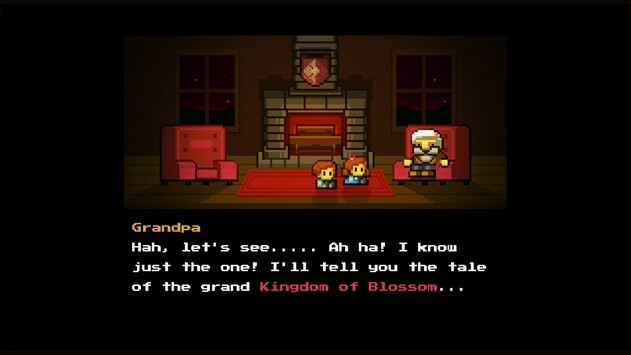 This game starts out with a grandfather reading his granddaughters a bedtime story about the brave Knight Lily, and throughout the game, you see him narrating the adventure… and when the granddaughters think the story is getting a little boring, he’s quick to spice it up with some extra danger or puzzles. It’s a charming, simple addition that goes a long way. Speaking of the granddaughters listening intently to this story, it’s hard not to smile and feel a sense of comfort at their childlike wonder. It’s almost as if you can see these little girls picturing themselves as Lily, going on all these adventures and saving the day. For anyone that has made the argument about wanting a female Hero of Time, this is for you. Blossom Tales is also just an extremely charming game. It knows what it is, what inspired it, and to me felt like it did a really nice job of serving me an equal mix of things I knew I wanted from a game like this and innovations to break up the formula. Not since Axiom Verge paid tribute to Super Metroid have I felt a game so finely walk the line between homage and innovation. Of course, a game can take all the ideas, themes, and mechanics it wants from another game, but at the end of the day, it still has to be good. And that’s the best thing I can say about Blossom Tales: it plays awesome. As a game, it’s great. As a game similar to my favorite series, it’s amazing. I would put it beside 2D giants like A Link to the Past or The Minish Cap and not think it out of place. I think a reason that I loved it so much might go back to the opening sentence. I’m not sure when we’re gonna see another 2D Zelda game again, and frankly, I’m not ready for them to stop being a thing. Blossom Tales reminded me of how much I love this genre and how great it can be. 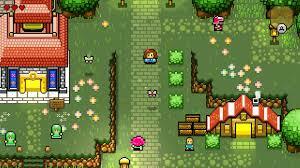 As a “Zelda Clone” game, Blossom Tales stands above the rest. If you own a Nintendo Switch and like Zelda, you need this game. It’s a charming, fun adventure full of heart and made with love – a love for the days of our younger adventures, when we first found out that we loved the Zelda series. Andy Spiteri is the Editor-In-Chief of Zelda Dungeon. Catch his interview with Blossom Tales lead developer Rob Maher on The Champions’ Cast here, and be sure to follow him on Twitter.